Sushi Sazanami opened its doors on April 13, 2017. That was an exciting day for restaurant owners Mineo Koshino, Jayvee Regala, and Zinnia Regala; however, the road to getting there was not so smooth. It was only 7 months prior, that Jayvee and Zinnia were sitting in the sushi restaurant that Mineo (known by many as Jimmy) was managing, when Mineo approached them about purchasing a restaurant. Jayvee and Zinnia had known Mineo since their daughter, Madison, was 2 months old; that was when they started going to Mineo’s prior sushi restaurant. They were very happy with the quality of his sushi, and they had approached him a few times about opening up a restaurant. Several years went by, until November 2016, when Mineo approached them and presented the idea of converting a Mexican restaurant into a sushi restaurant. The timing was far from perfect, but Jayvee and Zinnia decided this was a once in a lifetime chance to get into the restaurant business. They made an offer one week later, and they became the proud owners of a Mexican restaurant by the end of the month. One of their early priorities was finding a name for the restaurant, and they wanted a Japanese name that stood for a calming earth element. They initially thought they would use a name for “light breeze”, but Mineo called them one day and told them of a dream he had where he was wading through ripples of water. They decided to go with that peaceful dream he had, and that is where Sazanami comes from, “ripples of water”. They thought “tsunami” would better exemplify the experience they were going through, but Sazanami was a better fit for the warm, calm environment they wanted to establish. The next step was designing the restaurant. They initially planned on doing minimal changes to control costs, but none of them had any design experience. Could you imagine serving sushi at a Mexican restaurant? By chance, Jayvee and Zinnia went to a downtown sushi restaurant in Los Angeles and loved the design, but they did not know who the designer was. Their only option of a trusted designer was the one who did their house, although they were concerned the designer did not have any experience with restaurant design. When they checked the designer’s website, they found to their surprise that the designer did that downtown restaurant! Jayvee and Zinnia called them, and within a week, the Brown Design team came to meet them and started designing what would 5 months later become Sushi Sazanami! 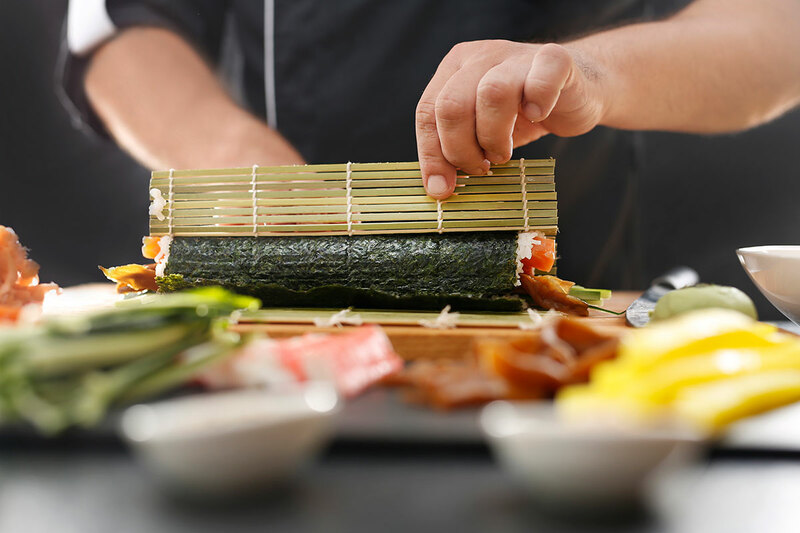 Chef Mineo is the key to Sazanami’s success as he brings a beautiful combination of tasty, quality sushi, while providing a nice selection of traditional Japanese cooking. Mineo was born and raised in Kanazawa Japan. This is where he learned to cook at a young age, as his family owned a traditional Japanese restaurant, also known as kappou restaurant. He brought those cooking skills to the United States, where he mastered his sushi skills several years later. There is no denying his meticulous approach to sushi and traditional Japanese cooking. 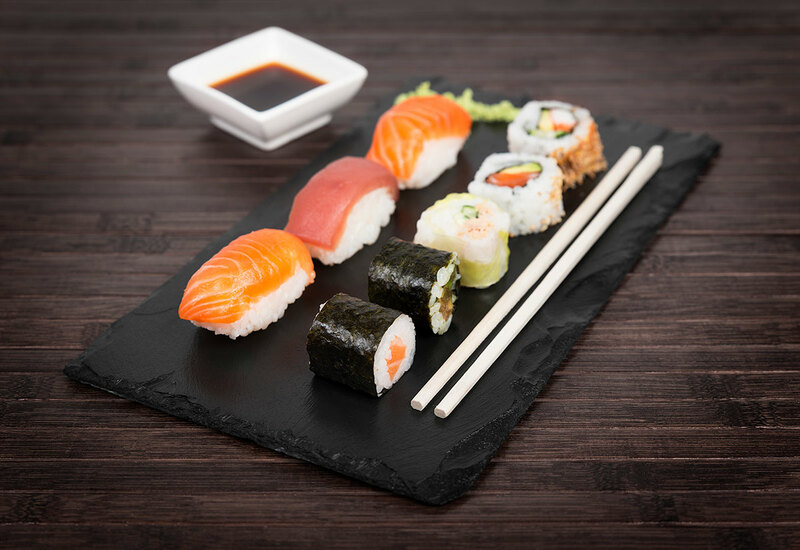 The Sazanami team prides themselves in quality, service, and reasonable cost, and they hope their customers will appreciate the relaxed, comfortable atmosphere the restaurant provides.